Donald Trump Delivers Foreign Policy Speech In Washington, D.C.
April 27, 2016  Donald Trump delivered a foreign policy address on Wednesday, complete with a teleprompter. It's supposed to be the first in a series of speeches aimed at demonstrating the Republican front-runner's policy chops. April 25, 2016  President Obama announced the decision in a speech to a trade fair in Germany. 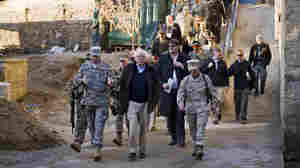 The deployment will bring the total number of American military personnel deployed in Syria to as many as 300. April 22, 2016  President Obama held a joint news conference with British Prime Minister David Cameron in London on Friday. He urged the United Kingdom not to sever ties with the European Union ahead of a crucial vote in two months. April 21, 2016  President Obama wraps up his visit to Saudi Arabia with a meeting of Gulf leaders to talk about the threat of ISIS. 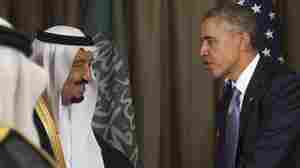 It follows a meeting between Obama and Saudi's King Salman amid tensions in the U.S.-Saudi relationship. 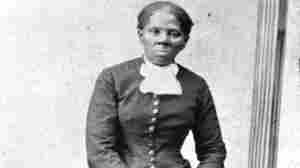 April 20, 2016  Alexander Hamilton keeps his place on the $10 bill while Andrew Jackson gets the boot, replaced by Harriet Tubman. April 18, 2016  As President Obama prepares to leave for Saudi Arabia, there is new controversy surrounding a bill that would effectively give 9/11 families the ability to sue the Saudi government. April 18, 2016  Leading candidates have tried to channel Americans' frustration when they talk about trade, but on the whole polls show Americans think trade has been good for the U.S.
April 14, 2016  Bernie Sanders has downplayed foreign policy in his presidential campaign, focusing primarily on domestic economic concerns. 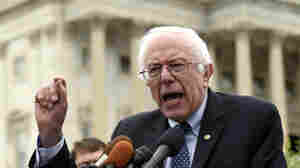 NPR looks at how a President Sanders might approach the world beyond our shores. April 14, 2016  He's against the Iraq War, but he is not a pacifist and he sees foreign policy through an economic lens. Here's what you need to know. April 7, 2016  President Obama on Thursday returned to the University of Chicago Law School where he once taught constitutional law. He used the forum to argue that Senate Republicans should consider his nominee to the Supreme Court. So far, Republicans said thanks, but no thanks. April 6, 2016  The Obama administration issued a new rule designed to safeguard retirement savings from costly and misguided investment advice. Some parts of the financial industry worked hard to block the rule, but it survived. April 2, 2016  Six years ago, the Obama administration launched an effort with other world leaders to secure nuclear material from the hands of terrorists. What was accomplished, and what wasn't? April 2, 2016  NPR's Scott Simon asks Rep. Ted Lieu about his bill to look at something pressing and still unresolved, despite the week's news: encryption and security.